Astronomers using the National Science Foundation's Very Large Array (VLA) have overcome longstanding technical hurdles to map the sky at little-explored radio frequencies that may provide a tantalizing look deep into the early Universe. The scientists have released images and data covering half of the sky visible from the VLA, and hope to complete their survey within a year. The VLA Low-frequency Sky Survey (VLSS) is producing sky images made at an observing frequency of 74 MHz, a far lower frequency than used for most current radio-astronomy research. "Because of the Earth's ionosphere, such a low frequency has proven very difficult for high-quality imaging, and it is only in the past few years that we have developed the techniques that make a project like the VLSS possible," said Rick Perley, of the National Radio Astronomy Observatory (NRAO) in Socorro, NM. Because the high-quality VLSS images will give astronomers a look at the Universe through what essentially is a new "window," they expect the images to reveal some rare and important objects. "We expect to find very distant radio galaxies -- galaxies spewing jets of material at nearly light speed and powered by supermassive black holes," said Joseph Lazio of the Naval Research Laboratory in Washington, DC. "By determining just how distant these radio galaxies are, we will learn how early the black holes formed in the history of the Universe," he added. 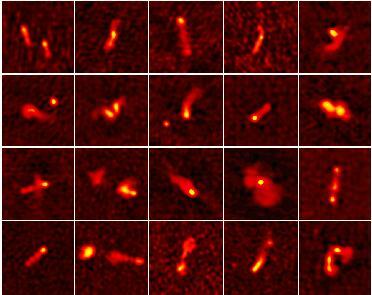 Another tantalizing possibility is that the low-frequency images may reveal "halos" and "relics" produced by collisions of galaxies in clusters. If the halos and relics are found in the distant, and thus early, Universe, it will give scientists important clues about the timetable for formation of large-scale structure. In addition, the astronomers hope that the VLSS images may show previously-undiscovered pulsars -- superdense, spinning neutron stars. Massive planets -- "super Jupiters" circling stars beyond the Sun -- also might reveal themselves through bursts of radio emission at the frequency of this survey, the astronomers speculated. Images from the survey are being made available to other scientists as soon as they are completed. The survey will use some 800 hours of VLA observing time. The newly-released images and data are available via the NRAO Web site. "By doing this survey and making the results available, we are bringing low-frequency radio data, previously quite difficult to produce, to all astronomers in a simple and easy manner," Perley said. "We also expect that this survey will spur additional research into objects that scientists find puzzling or interesting," Perley saidd. "We really will have to wait for years to know the full scientific benefit of this survey," he said. In addition to Perley and Lazio, the VLSS team includes James Condon and William Cotton of NRAO; Aaron Cohen and Wendy Lane of the National Research Council and the Naval Research Laboratory; Namir Kassim of the Naval Research Laboratory; and William Erickson of the University of Maryland and University of Tasmania.